Expert diagnosis and management of eye disease depends upon having a professional eye care team that cares about your vision and stays current with medical progress. 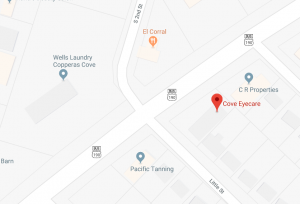 At Cove Eyecare, nothing matters more to us than your healthy, lasting vision. With first-rate skill and compassion, our Killeen eye doctor will perform a thorough eye exam to detect or rule out ocular disease. Our eye doctor, Dr. Micheline D. Young, strives to make your eye care experience as efficient and comfortable as possible. We use the latest, high-precision diagnostic tools during your Killeen eye exam to identify the signs of eye disease as early as possible. This allows us to begin treatment immediately, before your ocular condition deteriorates. The sooner we start treatment, the higher the success rate of preventing vision loss or complications. Great medical advances have been made in treating eye disease, such as macular degeneration, diabetic retinopathy, cataracts, and glaucoma. Our Killeen eye doctors keep pace with scientific research and new technology, so you’ll receive the most current, progressive and aggressive treatments. If you’re diagnosed with an ocular disease, we’ll meet with you to explain your condition and answer all of your questions. We believe that our patients should be well informed, which enables our Killeen optometrist to determine the most suitable treatment in partnership with you. An early diagnosis of glaucoma is the best prevention against this disease’s harmful effects. Glaucoma describes a group of eye diseases that interfere with the function of your optic nerve, thereby damaging clear vision. When left untreated, glaucoma often leads to vision loss. The beginning symptoms of glaucoma are usually silent, which is why it’s critical to have a Killeen eye exam done regularly after you reach 40 years of age. 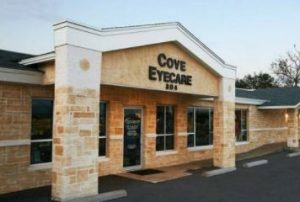 At Cove Eyecare, we will evaluate your eyes during a Killeen eye exam. Our eye doctor will use tonometry to measure your inner eye pressure. Treatment for glaucoma typically starts with eye drops. Laser surgery, conventional surgery or a combination of all of these treatments may also be advised. Cataracts are characterized by a clouding of your eye lens. This prevents clear and crisp images from appearing on your retina. Blurry vision will range from mild to severe, depending upon your personal condition. The good news is that cataract surgery has a high success rate at restoring vision. In this procedure, the eye doctor will remove your cloudy natural lens and replace it with a synthetic, transparent lens. Our Killeen optometrists will monitor your eyes and co-manage your cataract surgery so that you enjoy sharp eyesight again! At present, there is no absolute cure for macular degeneration. This disease damages central vision and the ability to view fine details. Treatment varies according to the type of macular degeneration. We may prescribe medications or inject drugs into your eyes. Laser surgery is another possible treatment. Our Killeen eye doctors will meet with you to discuss the most suitable course of action to provide you with quality, lasting vision. Diabetic retinopathy only affects people with diabetes. With this disease, the retina’s vascular network begins to leak or swell and vision is affected. When it starts, most people don’t notice the symptoms of diabetic retinopathy. Yet an early diagnosis is very important, as it enables early treatment. Currently, laser procedures or injections are used to shrink new blood vessels. Although there is no cure right now, treatment for diabetic retinopathy is taking large and encouraging strides. Our Killeen eye doctors keep close watch on these medical developments, so you’ll receive the best possible treatment. Macular Degeneration is a sight debilitating disease that requires expertise & accuracy to prevent vision loss. Therefore, Cove Eyecare utilizes Macula Risk to create a dietary supplement that's unique to your genetic makeup.